It was lunch hour at Anise, the fun food restaurant at the Taj Coromandel. The chefs were in full flow, tossing salads, yanking pizzas from the fiery mouths of ovens, aligning rows of tiny-jewelled deserts in tiers around the central buffet island when I heard the dreaded a�?Ga�? word. Gluten! In keeping with the latest trends in global eating patterns, chef Alok Anand had devised a gluten free menu for us as a special treat. The Gluten Club is very exclusive. One person out of 133 individuals in the developed part of the world, cannot digest a�?gluten.a�? From the Latin word for glue, it is a protein found in processed flour and related products. What it means is no bread, no pasta, no biscuits or cake or any of the rich maida and butter-laden sauces and soups. I looked with horror at chef Anand. There was no butter on the table, let alone a breadbasket with crispy bread-sticks. a�?Try the soup,a�? he said, as a bowl of pale broth filled with glass noodles, kaffir lime, tofu and bok choy arrived. Imagine a dragonfly sipping a raindrop from a lotus leaf. The second platter had circles of pink watermelon on which cigarettes of muskmelon filled with feta cheese had been stacked. Again a delight for the eye and tongue. By the time we got to the pan-seared Norwegian sea bass stacked with bell peppers, we were ready to sing. But there is one more surprise on the new Anise menu. A tiffin carrier so artfully designed, it splits open like a magiciana��s cupboard. Inside, four ceramic bowls display rice, curry, dhal and vegetables. They serve extras like rotis and salads at the table. Along with a dessert of kesari rasmalai, the tiffin comes at Rs 1,100 for vegetarians and Rs 1,200 for the non vegetarian version. 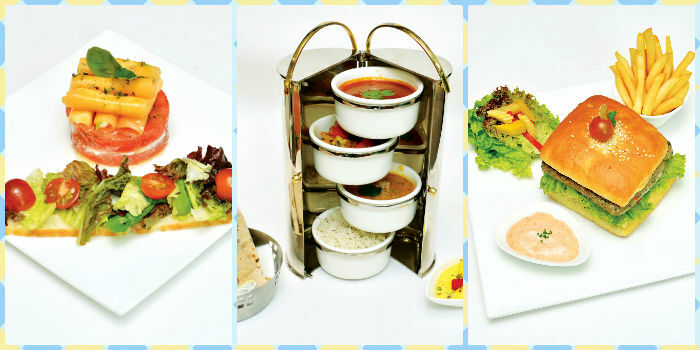 Like Irrfan Khan in The Lunchbox the tiffin is so dinky you want to carry it home.